Newly built in 2018, Wave Watcher is a rare standalone luxury home in one of the most desirable areas of Mission Beach. Just one home from the ocean, this location provides plenty of unobstructed ocean and beach views without being directly on the busy Mission Beach boardwalk. Beautifully designed and constructed in the latest in contemporary design, this 4 bedroom, 3.5 bath luxury home is tastefully appointed with elegant touches of wood, stone, ceramics and stainless steel. Unlike the majority of vacation rentals in Mission Beach, you’ll find this home to be very spacious with high ceilings and generously sized bedrooms. As you enter the home, you are welcomed into a beautifully appointed, contemporary space with soaring ceilings and a clean, elegant open concept design. Cantina-style doors and a low-slung, Italian leather sofa orientated toward an elongated built-in fireplace inset and impressive stacked-stone wall featuring an 80” flat-screen TV. The main living area features a true gourmet kitchen where conversation flows easily and whipping up your favorite dishes is a breeze. The custom-styled kitchen features a polished stone prep island and breakfast bar with stool seating, hardwood cabinetry and a commercial grade Wolf range and Sub-Zero refrigerator. The dining area is conveniently situated between the kitchen and living room and makes the perfect place to share a meal with friends and family. The ground level also features a queen bedroom with a ceiling fan, flat-screen TV and Cantina doors that open up wide to the exterior courtyard and ocean beyond. This level also features a convenient hall bath with walk-in shower. Take the sleek wood and glass stairway up to the second level where the remaining bedrooms are located. The Master Suite is its own private retreat. Comforts include a plush California King bed with lie down ocean views, gas fireplace inset into a stacked stone wall, flat screen TV, and folding Cantina doors that fully open up to bring the outdoors in and delivers the consummate Southern California beach living experience. The Master Bath is spacious with dual-sink vanity and a walk-in shower from where you can also see the ocean! Bedrooms 2 and 3 are also on this level featuring California King beds, ceiling fans and each with their own flat-screen TV's. There's also a convenient hall bath for this level with a dual-sink vanity and walk-in shower. Head upstairs and you’ll find an ocean and beach view deck with pub tables and chairs, and if you take the stairs to the next level, you’ll land at the spacious rooftop deck. This space comes complete with an outdoor kitchen with Lynx barbecue & dining table where you can dine under the stars with the panoramic views of Mission Beach and coastal San Diego as a back drop. As if that weren't enough, there is a 6-person Jacuzzi spa that completes the true resort-living experience. The beach and ocean are just steps away, incredible Mission Bay is a block away, and the Mission Beach boardwalk is at your doorstep and provides the pathway to fun and adventure all the way to Belmont Park to the south and Pacific Beach and Crystal Pier to the north. 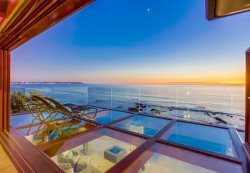 This beautiful beach side retreat is truly a unique and special vacation rental. Soak up the sun, watch the surfers and dolphins off shore, or take your morning stroll along the water to take in the salt air and sounds of crashing waves. We invite you to call our vacation planners to learn more and see if this where you'll be spending your next vacation! We will definitely try to use Bluewater anytime we are in your area! FANTASTIC LOCATION! Beach views without the lack of privacy that comes with being directly on the beach. Plenty of room with everything you need!